“Does China has a Military Strategy?” This pertinent question has been a longstanding query based on China’s ambiguous posture in delineating its military approach. The unpredictable nature of China’s strategic intentions has been the core factor in raising the suspicion and concerns over China’s military actions- raising the red alarms of ‘China threat’. Given this opacity, decoding China’s military strategy has become the quandary of global politics. In this view, China’s 2015 Defense White Paper does layout the blueprint of China’s military motivations. Therefore, in this regard, to gain a perspective in calculating China’s next move, it becomes imperative to decode the strategic rational of China’s proclaimed ‘Military Strategy’. 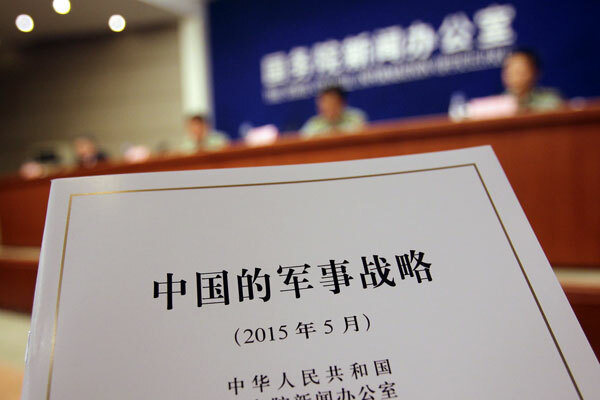 On 26 May, the State Council Information Office of the People’s Republic of China issued the latest Defense White Paper. Being ninth in the order since 1998, this defence paper marks a significant departure from its eight predecessors, in terms of adopting a concrete policy framework. Unlike being conceptualized under the existing norm of “China’s National Defense”, the current white paper titled“China’s Military Strategy”, is the first Chinese white paper which is exclusively premised on military strategy and thereby, provides a blueprint of China’s strategic military thought to the world at large. Rather than solely building on the old framework of ‘China’s threat perceptions’, the 2015 military doctrine, first of its kind, does give some transparency to China’s long standing opaque defence policy- denominating China’s strategic intentions by outlining a strategy that combines strategic defence with operational and tactical offence. In this view, the white paper is reflective of China’s bold and confident posture in the changing dynamics of the international system. By finally pronouncing the direction of its military buildup, it is clear that China has also taken a normative departure from Deng Xiaoping’s dictum of “Keeping a low profile”. This argument stands validated as China’s such a strategic move projects its confidence and military preparedness to ‘stick its neck out’. By pledging “active defense” as the essence of “CPC’s military strategic thought”, the White Paper posits China’s military intentions by clearly specifying: “We (China) will not attack unless we are attacked, but we will surely counterattack if attacked” and further added that “China will never seek hegemony or expansion”. Keeping this context, it becomes imperative to decode the underpinnings of this grand ‘Chinese Military Strategy’. Hereby, the assessment can be done under a three-tier framework of- context, content and scope that defines and distinguishes the 2015 defence white paper. First, the context that defines the essence of this white paper. Undoubtedly, it is born out of China’s imminent security concerns in the changing discourse of international system. Clarifying China’s military goal to “maintain regional and world peace”, and suggesting that “in the foreseeable future, a world war is unlikely, and the international situation is expected to remain generally peaceful”, the white paper outlines China’s concerns of “new threats from hegemonism, power politics and neo-interventionism”, whereby “the world still faces both immediate and potential threats of local wars”. Under these new circumstances, the justifications to China’s defensive military posture is equated by its threat calculations. In this case, the imminent security challenges as the paper notes is posited by US “re-balancing strategy” and “its military presence and military alliances” in Asia; Japan’s increasing militarist posture for it “is sparing no effort to dodge the post-war mechanism, overhauling its military and security policies”. It also mentions that “some of its offshore neighbors take provocative actions and reinforce their military presence on China’s reefs and islands that they have illegally occupied”- clearly hinting at Philippines and Vietnam. Adding to this, it emphasizes on how “some external countries are also busy meddling in South China Sea affairs” and “maintain constant close-in air and sea surveillance and reconnaissance against China”. Besides, it also reiterates China’s core security concerns over “Taiwan independence”, “East Turkestan independence” and “Tibet independence”. Second, the content that defines China’s military strategy. Undoubtedly, the White Paper fosters a heavy tone to Chinese military posture to realize the Chinese Dream as it claims “[w]ithout a strong military, a country can be neither safe nor strong”. For China’s armed forces, the primary goals are: “[to build] a strong military”, focus on “core security needs”, build an “informationized military” and win “informationized wars”, “deepen the reform of national defense and the armed forces”, “build a modern system of military forces with Chinese characteristics”, and “enhance their capabilities”to address security threats and accomplish “diversified military tasks”. To meet these goals, the armed forces will adhere to the principles of flexibility, mobility and self-dependence so that “you fight your way and I fight my way”. Thereby, in safeguarding its interests, China wants to follow a military strategy of “active defence”, which the Chinese view to be in contrary to “proactive” defence policies of other international actors mainly United States and Japan. That is, Chinese military will focus on growing internationalization of its military role under active defence. The motivation behind this “active defence” posture is to dispel China’s military strategy from being interpreted as that of aggressive, expansionist or interventionist. The major shifts undertaken in China’s defence strategy as outlined in Section IV of the 2015 white paper: The PLA Army “will continue to reorient from theater defense to trans-theater mobility”; The PLA Navy “will gradually shift its focus from ‘offshore waters defense’ to the combination of ‘offshore waters defense’ and ‘open seas protection’” and; the PLA Air Force “will endeavor to shift its focus from territorial air defense to both defense and offense”. 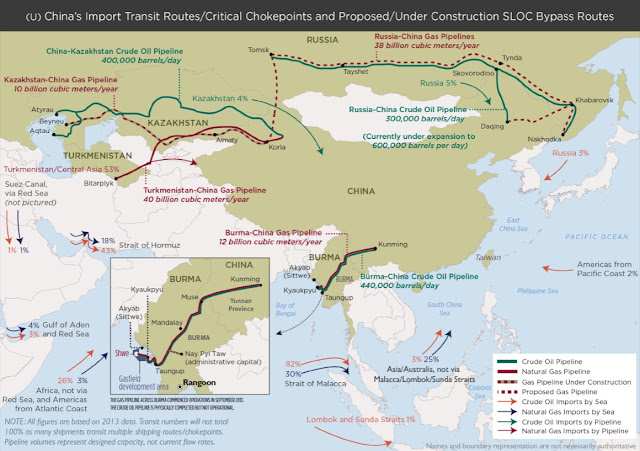 “With the growth of China's national interests, its national security is more vulnerable to international and regional turmoil, terrorism, piracy, serious natural disasters and epidemics, and the security of overseas interests concerning energy and resources, strategic sea lines of communication (SLOCs), as well as institutions, personnel and assets abroad, has become an imminent issue”. And lastly, scope of the military strategy is primarily centered in the maritime domain, that is to win “informationized local wars” by “maritime preparation for military struggle” - wherein China wants to build a ‘blue-water navy’. This forms the key nodal point of the 2015 defense white paper. In the row of security concerns that disturb China’s strategic interests, thus as the white paper declares it is a “long-standing task for China to safeguard its maritime rights and interests”. As it is suggestive that the PLA Navy (PLAN) will imbibe greater role in shifting its focus from “offshore water defense” to combining it with “open seas protection”- taking a shift from defence to offence. Endowed with an estimated 14,500 kms coastline and faced with tensions in the crucial international waters, the white paper makes a strong pronouncement of China’s maritime strategy by stating that: “The traditional mentality that land outweighs sea must be abandoned, and great importance has to be attached to managing the seas and oceans and protecting maritime rights and interests”. This is indicative of China’s maritime posture whereby an Air Defence Identification Zone (ADIZ) over the South China Sea (SCS) cannot be outlawed as its ongoing reclamation activities strongly call for China’s assertive ADIZ move in the future. Therefore, it signals a warning to the other actors in the SCS dispute. While what makes the shift to the seas more imperative is China’s grand vision of “One Belt, One Road” Initiative, wherein China’s seapower capabilities will equip it to realize the dream of “21st Century Maritime Silk Road”- a grand vision that challenges the western world order. The exemplary lies in China’s recent plans to build its first overseas base in Djibouti- a strategic move to expand its naval military capabilities in the Indian Ocean region. Therefore, in an overall analysis, it can thus, be construed that the 2015 defence white paper on “China’s Military Strategy” does provide some direction in understanding China’s future moves. It is clear that China will grow much bigger both literally and figuratively in its strategic military capabilities in order to secure its national interests. The significant shift is visible in terms of moving from being a continental power to that of becoming a sea-power- equipped with a ‘blue-water navy’. Therefore, in the near future, China’s military muscle will experience its obtuse flexing mostly in the critical international waters- mainly South China Sea, East China Sea and Indian Ocean. Therefore, with the fall of events, only time can spell the way the strategy will be played out by China in order fulfill its unparalleled ambitions.